BUENOS AIRES – With the backing of the Israeli Football Association (IFA), Comtec, an Israeli production company, has announced that it will send a delegation to FIFA headquarters Switzerland and push for the Argentinian football team to be removed from the upcoming World Cup in retaliation for the recent decision of Argentina’s Football Association to cancel a “friendly” match against the Israeli national team that had been scheduled for this Saturday. According to reports, Comtec – which was involved in planning the match – and the IFA are set to claim that Argentina should be expelled from the World Cup in Russia due to “religious discrimination” against the Jewish people after choosing to stand in solidarity with Palestine. On Wednesday, the national football team of Argentina shocked the world as it announced it would not participate in a “friendly” match after pressure from Palestinian rights groups, including Boycott Divest Sanctions (BDS). It was only the latest victory for Palestine solidarity activists as several other Latin Americans of note, such as musicians Shakira and Gilberto Gil, have also canceled public appearances in Israel in the wake of Israel’s massacres of unarmed protesters in Gaza. Israeli Prime Minister Binyamin Netanyahu – while he has yet to make a public statement on the matter – desperately tried to intervene and salvage the match in a phone call Argentinian President Mauricio Macri on Tuesday night. However, his efforts were ultimately unsuccessful. Accusations of “terrorism” from Israeli officials have their origins in efforts by Jibril Rajoub, president of the Palestinian Football Association (PFA), to protest the match were it to have taken place. Those efforts involved Rajoub calling last Sunday for “everyone to burn their Messi shirts and pictures and renounce him” if the game continued as planned. Rajoub statements form the basis of an official complaint that the IFA has filed against its Palestinian counterpart as Israeli football officials blamed Rajoub’s “physical and brutal” threats to burn clothing as having been responsible for the match’s cancellation. Subsequent statements issued by Argentinian players and officials have since proven Rajoub right as they have indicated that the Argentinian team’s decision was a direct response to appeals they had received from Palestinians and their advocates. Hugo Moyano, Second Vice President of Argentina’s Football Association (AFA) told Argentina’s Radio 10 that the decision was out of sympathy for Palestinians, stating that “it was the right thing to do, it was not worth it. What happens in these places, where so many people are killed, cannot be accepted by any human being. The families of the players were suffering.” Moyano’s statement is a likely reference to Israel’s crackdown on recent protests in Gaza that have left over 13,000 unarmed protesters injured and nearly 200 dead, including a young Gazan medic who was recently shot in the chest by IDF snipers. 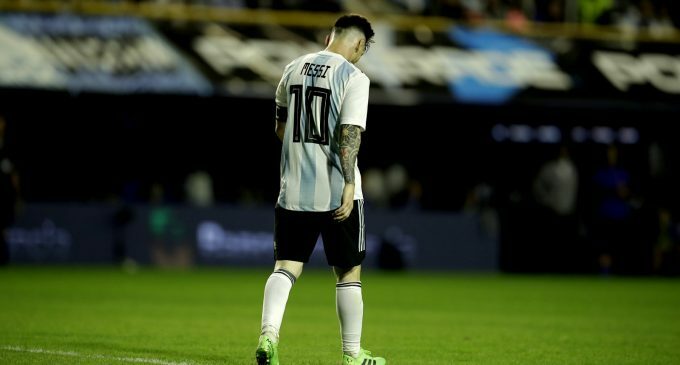 Argentinian President Mauricio Macri, in speaking to CNN, also noted that the decision was motivated out of sympathy was reached after other players decided not to participate “in solidarity” with the team’s superstar, Lionel Messi, after he chose to support the boycott. Messi has been called the “best footballer of all time” and his appearance in Israel had been widely anticipated by Israeli sports fans. Argentinian footballers have since spoken publicly on the matter, such as striker Gonzalo Higuaín, who confirmed that the decision to cancel the match was made in a show of solidarity with Palestine, stating publicly that “not going to Israel was the right thing to do” given recent events in Israel. Media reports in Argentina noted that it was BDS’ campaigning – not “death threats” – that influenced players to cancel the match. Argentinian newspaper Clarín wrote that protesters’ use of a megaphone during a practice match in Barcelona had been effective as it had called on players individually and by name. The report asserted that the individual nature of the call to boycott the game made it “no longer possible to be indifferent to what was happening” in the Gaza Strip. In addition, the case of Palestinian footballer Muhammad Khalil Obeid was also influential. Obeid, who was shot in both knees by Israeli snipers during the recent protests, saw his promising sports career slip away as a result of the devastating injuries as both of his kneecaps had to be removed. He made personal appeals to the players, and Messi in particular, to cancel the match with Israel in solidarity with Palestine. Video footage shows that Obeid was standing, unarmed when he was shot by snipers in late March. As Israel seems to be in full-scale preparations for another disastrous war targeting Gaza, the Argentinian football team’s decision is a likely prelude to more BDS victories in the coming months as Israeli apartheid and state repression of Palestinians can no longer be ignored. The post Israel Pushes FIFA To Punish Argentina Over Solidarity with Palestine appeared first on MintPress News.